Mike is back again! Unlike a still sizeable chunk of Genesis fans he doesn't seem to expect a Genesis reunion and has been focusing more on his solo career with the Mechanics since 2011. Even though they are a completely different line-up apart from drummer Gary Wallis, Rutherford probably noticed that his past hits can still wow an audience during his many concerts since the comeback album The Road. Thus, it's no wonder that he and/or his management want to play that card to remind the world once more that there is some quite successful previous history - even though the time after his last 1996 "Hits" compilation saw barely any new ones. To make sure that buyers from back then also buy the new compilation, it features a new, exclusive track on the CD and - should that not be enough - a 2CD edition with numerous rarities. Among these is an as yet unreleased song with Mechanics singer Paul Young, who died in 2000. Not much needs to be said about the songs on the first CD. It features almost all single releases, however, nobody took the time to search the archives for the actual single or radio versions that are sometimes different from the album versions. Buyers, thus, mostly get the singles' album versions, which are then sometimes faded out a little earlier to save room on the CD. Just like on "Hits", there are three songs from the 1985 debut album Mike + The Mechanics: Silent Running (On Dangerous Ground) shortened by half a minute (not the single version with the shortened intro), the 1996 "Hits" re-recording of All I Need Is A Miracle (but not the radio edit) and Taken In, which is faded out a little earlier (but was faded out even earlier on the 7" that was released in the US and Canada). The European single Hanging By A Thread was left out again. Songs from the second album Living Years from 1988 are: the album version of Nobody's Perfect faded out earlier (not the edit), The Living Years, Nobody Knows (not the single remix) and this time also the US/Canada single Seeing is Believing. The non-album US single Revolution, a Beatles cover from the 1989 Rude Awakening soundtrack, was put on disc 2. The 3rd album Word of Mouth from 1991 had five single releases three of which are included here: naturally the title track Word of Mouth (not the single mix), A Time And Place and Everybody Gets A Second Chance. The "EU-only" singles Get Up (which was included on "Hits") and Stop Baby. The 1995 album Beggar On A Beach Of Gold marked the departure of previously permanent members Peter Van Hooke (drums) and Adrian Lee (keyboards) from the band, but it gave the group three respectable (radio) hits in Europe that needed to be included just like on "Hits": Over My Shoulder (not the US remix as is to be expected), A Beggar On A Beach Of Gold (faded out slightly earlier) and the single edit of Another Cup Of Coffee. An edited version of the North American radio single of Mea Culpa is not included. After the 1996 Hits compilation with the re-recording of All I Need Is A Miracle and before the death of Paul Young, another album was released in 1999 without any real title, which is known as M6 and had two single releases: first there is Now That You've Gone (it is not the single edit here) and then Whenever I Stop, which - at least in Europe - were both played a lot on the radio. The single remix of All The Light I Need that was only released on a promo CD was understandably not included. After sadly shrinking to a duo, Mike Rutherford and Paul Carrack published the album Rewired in 2004 with the help of a few old and some new faces. Even though there was a video for each track, there were only three "radio edit" tracks that only exist as promo CDs: neither One Left Standing, nor If I Were You made it on the compilation and Perfect Child was pushed to the bonus tracks after there was no room for a new track on CD1. After seven years without the Mechanics, Rutherford released a new album titled The Road in 2011 with a new line-up including new faces Andrew Roachford and Tim Howar. Of the three radio promos Reach Out (Touch The Sun), Try To Save Me and The Road (all sung by Roachford) at least the album versions of the first two made it on the compilation. The new song When My Feet Don't Touch The Ground is also sung by Andrew Roachford. It's a not very complex mid-tempo radio pop song written by him and Mike Rutherford and produced by Rutherford's son Harry. This song sung by Paul Young vanished somewhere in the archives back then for unknown reasons, even though this groovy rock song definitely has its charms and hit potential. Unfortunately, it's not entirely clear when the song was written. Without the e-drums but with the Hammond organ it's most probably from the 1990s and was possibly intended as a bonus track for the 1996 Hits compilation, but didn't finish production. According to Mike Rutherford, the song is from the M6 sessions. Harry Rutherford now finished producing the song. This light and fun song with slight Motown elements written by Rutherford/Carrack and sung by Carrack is one of the numerous outtakes from the 1995 Beggar album and was released on the Beggar single CD. With this ballad composed entirely with only a piano and strings, an emotional Paul Young impressively proves that not only his interpretations of rock songs are good. It's unclear why this Rutherford/Robertson track didn't make it on the 1991 Word Of Mouth album, only being featured on the B-side of the Get Up / Stop Baby single. The only outtake from the 1988 Living Years phase was released as a B-side of the single with the same name. The song was written and produced by Mike Rutherford and Christopher Neil and sung by Paul Carrack. It has an almost sunny and Caribbean flair, which was probably why it didn't fit in on the more melancholy album. It gets melancholy with this Rutherford/Carrack collaboration of the Beggar era. Sad verses with a programmed groove alternate with the powerful, longing chorus. The song produced by Rutherford/Neil was released as part of the Another Cup Of Coffee single. A reworked version was included on the best-of compilation Favourites that was only released in Sweden in 2000 by the way. It was composed by Mike Rutherford and BA Robertson and sung by Paul Young. The snappy and swinging, but more melancholy pop song also didn't make its way on the Beggar album and found its spot on the B-side of the Over My Shoulder single. It was produced by Rutherford and Neil like all songs from this time. The fourth leftover of the Beggar album was also written by Rutherford and Robertson. Here, Carrack's vocals alternate between the soft ballad-like verses and the almost angry choruses. The song can be found on the already mentioned Coffee single. This Rutherford/Neil song is unusually rocking. The guitar riff of the Beggar outtake is sometimes reminiscent of I Can't Dance in style of playing and pace, but is interrupted by the double-speed choruses that are nice for bawling along and would feel right at home in a stadium. It was released as one of the bonus tracks of the Beggar single. This Rutherford/Carrack/Robertson composition produced by Mike and Peter Van Hooke isn't really a rarity since it is a regular Rewired album track from 2004. This relatively electronic mid-tempo song with a sing-along chorus that's very suitable for radio was originally intended as the only song from the Rewired album, which Mike doesn't like very much, on disc 1 of the compilation. However, it was banished to the bonus disc in favour of the new, exclusive track When My Feet Don't Touch The Ground. The single promo contained a radio and TV edit by the way. 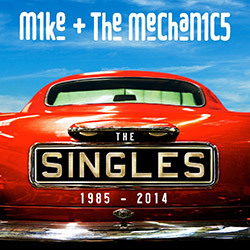 In 1991 this was the Mechanics' first try to present acoustic versions of songs. Unlike in the regular version on Word Of Mouth Carrack's singing comes out better with the only accompanying instruments being an acoustic guitar, a little bit of piano and strings and light drum strokes. The version produced by Rutherford alone was released on one of the Stop Baby single CDs. This Rutherford/Neil composition from the Beggar phase with Young's vocals starts with a driving drum machine pattern. It alternates between solemn verses and optimistic choruses uncharacteristically accompanied by a retro acoustic rhythm guitar. Another Rutherford/Neil track from the Beggar sessions. Here, it is a typical ballad for Paul Carrack though. We have a true "outlier" here. It's a version of the Beatles classic produced by Tom Lord-Alge and Mike Rutherford that wound up on the soundtrack to the film Rude Awakening and was also released in North America as a single. The precise line-up for the recording is unknown but both Pauls share the vocals. Even though both of these live tracks were released as bonus tracks/B-sides in 1988 and 1991 respectively, these were definitely different recordings. The live version of I Get The Feeling released on the 12" and single CD of The Living Years is from the 1986 US tour, but the one we have here should be an as yet unreleased recording from the 1989 concerts. The same goes for the live version of Taken In that is used here, which is also a different one from the one that was released on the limited single CD of Word Of Mouth. Why the (better mixed) original tracks weren't used is not quite clear. The remix originally released in 1991 on the 12 "/single CD of A Time And Place, which doesn't have all that much in common with the original, is included with a version that is faded out one and a half minutes earlier. As a final piece, here is a little titbit for the fans. The instrumental track written and produced by Mike himself was released as a B-side to the Mechanics' 12" to Silent Running, but is clearly from the recording sessions for his second solo album Acting Very Strange from 1982. It seems that it was time to strategically get some attention with hits from the past. 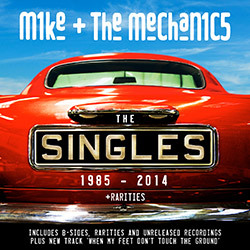 The Mechanics' biggest successes were already included on the Hits compilation, which means that most titles overlap, and are in fact the same versions namely the album versions. It would have surely been better for fans, collectors and radio listeners to use the various single and radio versions for the new 1CD edition. That way, fading out some of the songs earlier for time reasons would have been unnecessary. But the only slightly more expensive 2CD edition more than makes up for that. All the Mechanics' non-album tracks that are often on the same level as regular album tracks in terms of quality are now available on this disc. Even though there are still some rarities that would have fit in well on the compilation like, for example, the extended versions of All I Need Is A Miracle and Nobody's Perfect or the Mechanics live version of the Rutherford solo track I Don't Wanna Know, but with this unexpected "nice" gesture with this rarity disc from Mike, management and the record label, criticism doesn't need to be all that harsh. Still: It wouldn't be a bad idea to consult the well informed fanbase for releases like these in advance.